Nobody’s Poodle is a wooftastic ‘tail’ about a lovable ex-pat pooch living in Tenerife. He writes, from a dog’s point of view of course, about settling down in a new country, coping with the cultural differences, and learning the language (although woof-speak is universal, mas o menos, there are still some differences which need to be understood, otherwise a dog can have muchos problemas with his furry Latin amigos). The ex-pat / travel genre has been popularised by some very successful books, but until now man’s-bestfriends’ take on it has been little explored. We’re familiar with “Driving over Lemons”, but there hasn’t been a “Bouncing over Bones”. Most of Tenerife’s ex-pat Brits know and love Joe Cawley’s “More Ketchup than Salsa”, but we’ve all been waiting for “More Saliva than Salsa”. 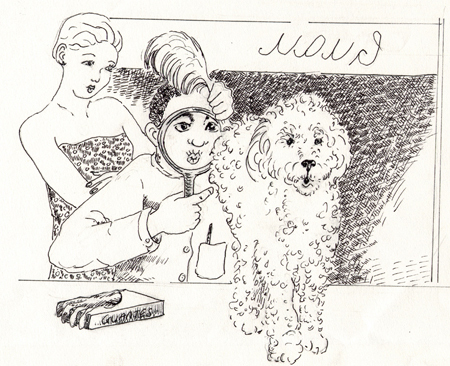 Nobody’s Poodle is much more than an ex-pat diary though. It’s a gripping story, with a plot that is the mutt’s nuts. Our intrepid hero, Gizmo (or Sr el Giz as he’s known locally and on Facebook) may be more street Doodle than swanky Poodle, but he’s very much his own dog. He’s all about standing up for the underdog, and it gets him into a fair few scrapes on the mean streets of Costa del Scorcio. Full of twists and turns, with a cast of wonderful woofers, and some beautiful illustrations, it will make you laugh and it will make you cry. Quite simply it’s the dog’s danglies of a book. Gizmo talks about Nobody's Poodle from Doodle on Vimeo. Guardian Top 50 Readers List ! NIKKI ATTREE Worked as a freelance photographer and digital artist in the UK. Since moving to Tenerife in 2007, she has been helping to promote the hardworking animal rescue centres there by producing calendars and educational poster campaigns. Her website: TenerifeDogs.com is dedicated to finding homes for the island’s abandoned dogs, as well as being a mine of information and an insight into the canine world. RICHARD ATTREE Grew up in London in the 60′s and left home as soon as he could to study a variety of useless subjects (philosophy), and play keyboards in various unsuccessful bands. He worked as a composer of music for TV, at the BBC’s renowned Radiophonic Workshop before going freelance with his own studio near Brighton. Tiring of the stresses of freelance life he decided to retire, sell up, and “downshift” to a sunny, windy beach on The Reef (Tenerife). Despite working for most of his life as a musician, Richard has always hankered after the straightforward, direct communication of language. Illustrator Annie Chapman – Annie trained in Graphic design and illustration as well as Art and drama. She is originally from Lincolnshire in England but has spent over 20 years living and working in Tenerife and has worked as the principal Art teacher at a private British school in Tenerife for the past ten years, where she teaches art up to A-level. She has exhibited her artwork on the island and has illustrated two published books. Although primarily a cat-person Annie has thoroughly enjoyed getting to know Gizmo and his friends and is 100% pooch-friendly.